Events like this make me feel lucky to live in California. This August 8 lecture at the Santa Barbara Maritime Museum with shark legend Ralph S. Collier and Peter Howorth promises to be fascinating! Should I Get a Bigger Boat? What should you do if a shark takes a fancy to your boat? 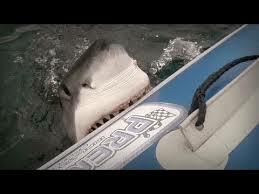 Yes, this really does happen––boats have been attacked by sharks. Find out why this happens and much more as Ralph S. Collier, the west coast’s leading authority on shark attacks, explores various theories on why sharks attack everything from surfboards to boats, and from crab trap floats to people. Learn what makes a shark tick and why it is such a supremely well-adapted predator. Discover from Peter Howorth how attacks on marine mammals can serve as canaries in the coal mines, warning people of shark hazards, and what is being done about this. If you are in the Santa Barbara area on August 8, 2014 please stop by. Directions to the Museum are available on the SBMM web site when you order tickets. After you order tickets please notify the SRC so we can place you on our Members list for this event. For confirmation of SRC Membership, and to obtain the $5.00 discount per ticket, please print out and bring this email. Seating is limited so order your tickets today. Thank you and we look forward to seeing you August 8th at the Santa Barbara Maritime Museum. Please sign this petition to ask the European Commission and Regional Fisheries Management to put limits on shark fishing. According to the Shark Trust, three of the world’s top 20 shark fishing nations are European (Spain, France and Portugal). Current laws allow many shark species like short fin mako to be caught in unlimited numbers. Many of these sharks aren’t caught for meat. 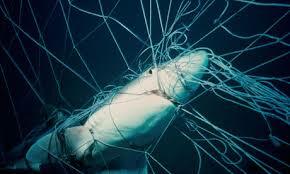 Trawls, long lining, and gill nets catch huge numbers of sharks as target species and as bycatch. One longliner can deploy up to 200 longlines in one set–lines that contain some 3,000 hooks and stretch for 60 miles. Without placing limits on the numbers of sharks caught, these destructive fishing methods are putting more pressure on animals whose numbers are already falling rapidly. We need to support the adoption of stricter laws for catch limits in Europe to prevent a collapse of Atlantic shark populations. Thanks for adding your name & sharing this petition! 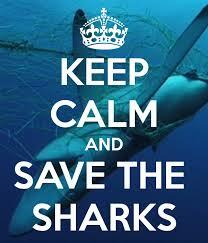 Day 301 4/23/14: Hope for Australia’s Sharks? This glimmer of hope comes from shark divers blog. 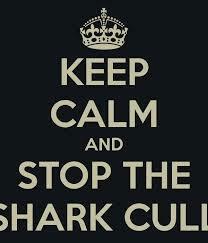 Western Australia has decided to open up the shark cull policy to a Public Environmental Review. This means that for a four week period, the public can send in their thoughts about the shark kill plan. I will post more information about where the public can send in their comments as soon as it’s available. In the meantime, check out these tips about how to compose an effective, rational letter & for a handy shark fact sheet. While I am more than tired of the “Keep Calm” sentiment in all its myriad forms, I have to admit in this case it’s handy as it reminds me of the necessity not to get too fired up and freaked out before I write a letter about an issue that I hope to change someone’s mind about. 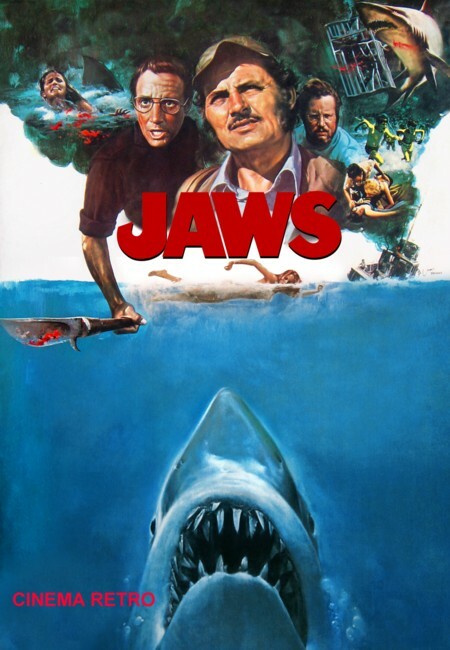 Day 299 4/21/14: Run for the Sharks! 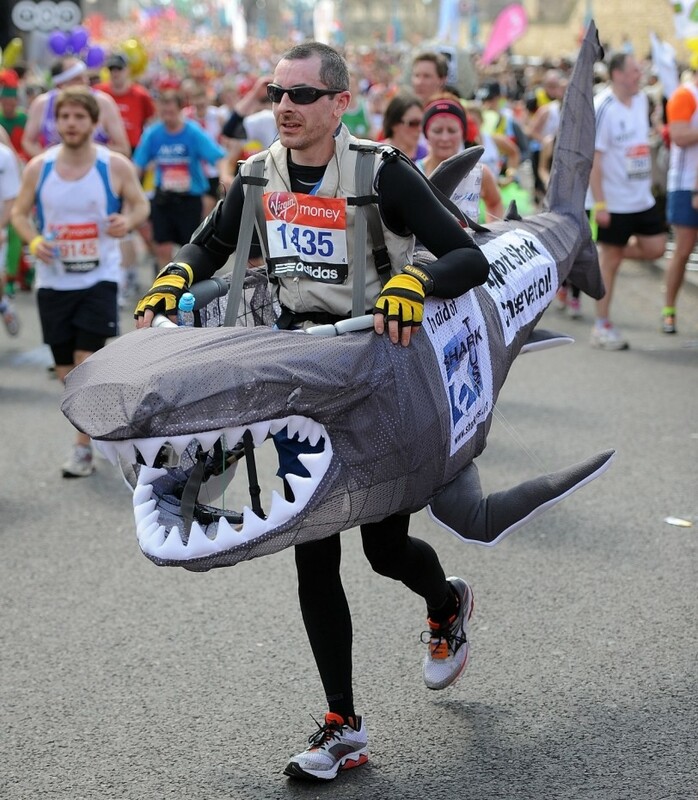 To raise money for a Bay Area shark sanctuary, Shark Stewards is sponsoring Run for the Sharks, in the San Francisco Bay to the Breakers race this May 18 ! Dust off your full-length shark costume and join the well-organized madness! To register to run, click here. If you’re really bananas, you can also join The Shark Centipede--a group of 14 costumed runners who run the race attached to one another. Buy a handmade Pura Vida bracelet for $5 to support shark conservation, or sponsor a runner. If designing inventive yet maneuverable shark costumes is your bag, or you’d like to donate $ or be a corporate sponsor, click here and scroll to the bottom. 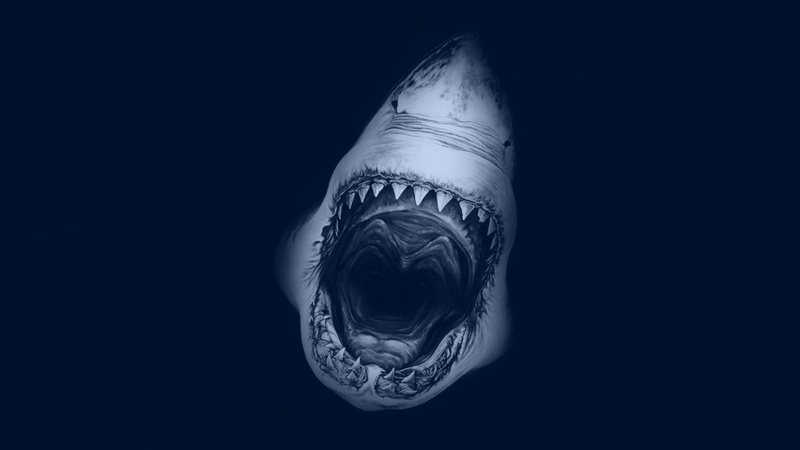 Day 277 3/30/14: The Coolest Shark Site…EVER….. The ocean is oddly silent and still, then a white shark bursts out of the water, nearly sending a startled kayaker into the water. A surfer watches a black dorsal fin slice the surface and disappear. Headless seals wash up on the beach. These are just some of the thrilling dispatches from Pacific Coast Shark News, my favorite feature of Ralph Collier’s Shark Research Committee website. 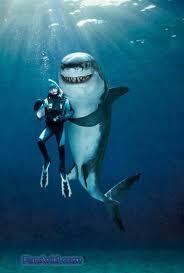 I have learned a tremendous amount about shark behavior and intelligence just from reading Pacific Coast Shark News. But keeping detailed and accurate records of shark activity along the Pacific Coast is only a small part of SRC’s very important work. They are currently working on a pioneering non-invasive DNA project that if funded could revolutionize shark conservation. The identification and migration patterns of specific shark populations through DNA, could help researchers predict the chances of future attacks offering an alternative to the barbaric retaliatory slaughter of sharks, like the “cull” happening in Australia right now. 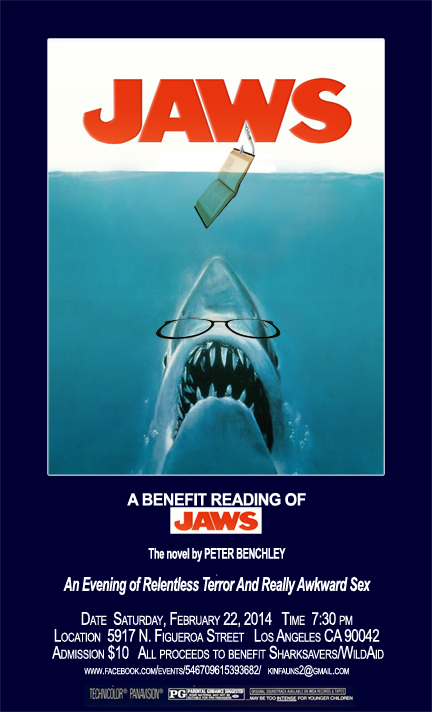 For a $20 donation, you will receive the fascinating SRC Quarterly e-mail newsletter and for $70, you will receive Ralph Collier’s utterly riveting, lavishly illustrated book Shark Attacks of Twentieth Century. Please consider making a donation of any amount, even $10–to help SRC continue its essential conservation and education efforts. 1. This $75 pewter shark head staple remover adds a certain savage gravitas to a desktop. 2. Become part of the fight to save sharks by joining The Shark Research Committee. A $70 membership fee entitles the lucky recipient to the SRC Quarterly newsletter and a signed copy of the lavishly illustrated and utterly engrossing book Shark Attacks of The Twentieth Century by Ralph Collier. 3. For the pint-sized naturalist: L.L. Bean’s great white sleeping bag looks awfully cozy! 4. I don’t know about you, but I really need this 4-D transparent white shark anatomy model with its 20 removable organs and body parts. 6. Pangea Seed blends art with activism collaborating with artists & scientists to raise awareness about sharks and other marine life in peril. The proceeds from Pangea Seed’s Art prints, sustainable clothing , shark pendants & other cool stuff go directly to their conservation efforts. This eccentric Australian diver/environmentalist travels the countryside in a bus filled with marine artifacts including a 5 meter white shark to educate the public about “killer” sharks. Admission fees collected for his “mobile museum” are donated to ocean pollution campaigns. 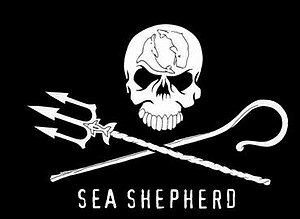 And on the subject of unusual forms of advocacy, check out this interview with Debbie Salamone of Shark Attack Survivors for Shark Conservation….I also just discovered Operation Blue Pride, a group injured war veterans that have come together to dive with sharks and promote awareness about ocean conservation.